Well it’s that time of year again. One year draws to the close and we reflect on what has happened. Another year is about to start and we establish our goals for what is to come. It’s a good thing to do. Without reflection and goal setting we may just end up doing the same thing over and over again. 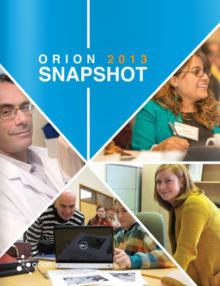 But I have to say that 2013 kept us very busy at ORION. We added several new school boards on the network which meant another 100,000 students, researchers and teachers using the ORION network. That makes over 2 million people in Ontario who use the network every day. Network usage continues its exponential growth at over 50% per year – a trend we’ve seen now for over five years. As a result, there has been an unexpected increase in the number of organizations upgrading, or planning to do so, to 10Gig connections to ORION. That makes 6 within the first year of offering 10Gig links. There are some pretty fantastic things happening on our network. That includes online learning, advanced computing, data sharing, cloud services, and leading edge advancements in health. You can find all this and more in our newly-released annual report, “Snapshot 2013”. That pretty much sets the stage for 2014 – continue to support growth in bandwidth utilization and increased number of users. We also see the coming year bringing an explosion in use of cloud services within the ORION Nebula. ORION has partnered with several world-class providers to offer outstanding cloud implementations. And the list of providers and technologies keeps growing. Collaborations between our user organizations are beginning to blossom. These shared services of disaster recovery, software license sharing, and shared administration activities all use ORION’s connectivity to ensure robust and reliable service delivery. As they strive to be more efficient and effective, our users will be doing even more of these types of collaboration in the coming year. ORION continues to respond to all of these activities, as well as the massive changes that we see driving the future. And we are stepping up the game for 2014. We will be initiating an intensive year-long strategy and planning exercise. In fact, it has already been developing over the last few months. It’s called the ORION Nexus Project, and the goal is to have a very clear and implementable 10-year plan by the end of 2014. It will be about what ORION will need to do and how it will operate in order to meet the future needs of all our users in Ontario. And that’s how the Nexus Project will start in 2014 – by focusing on user needs. The first six months will be an intensive engagement with all the key user groups. ORION’s staff will be engaged in an outreach campaign where we will have face-to-face meetings with individuals and groups, teleconferences, workshops and online surveys. The topics of discussion will be the 5C’s – Connectivity, Computing, Content, Cloud and Community. ORION has been using this strategic framework throughout 2013. Given the positive feedback that they cover the essential elements, we will continue to use them for our future strategic interactions. The intent is to connect with as many users as we can and get their feedback on their needs and challenges as direct input to our strategic process. Once that’s done, we’ll analyse and extract some trends that will help us focus our planning. Our users will once again be engaged in that process to ensure that we are on the right track. The goal is to create an ORION that best meets the future needs for all of Ontario and one that helps transform our users to meet their own challenges. It is an exciting time for all of us and I look forward to even more collaboration and growth to achieve the opportunities that are before us.